New power rates for Tacoma Power customers went into effect on April 1, 2018. As a publically owned utility, we only bill for the revenue required to run our business. This increase, approved by Tacoma City Council which was approved in April 2017, helps us cover the estimated $1.2 billion needed to meet regulatory guidelines and continue to invest in resources technology to continue to provide safe and reliable service to our customers. Energy Charge – this charge will vary based on how much energy you use each month. All customers saw the monthly “fixed charge” increase from $13.50 to $16.50, effective April 1. This fee covers administrative costs, like reading and servicing your meter, preparing and mailing bills, and maintaining and updating billing records and applicable franchise fees. On average, residential customers saw an average total increase of $5.88 in their monthly bill (fixed charge + energy charge). Businesses and small commercial customers who pay a Schedule B rate saw an average 2.4% increase in their monthly bill. Large commercial customers who pay a Schedule G rate saw an approximate 5% increase in their monthly bill. While we know any increase has an effect on people, Tacoma Power customers still enjoy some of lowest rates in the Puget Sound region. The increased rates will allow us to continue to operate and maintain the system that keeps your home supplied with safe, reliable power every day. Tacoma Power continually receives high satisfaction ratings for service reliability and responsiveness, even with an aging infrastructure that requires continual maintenance and upgrades. We maintain seven hydroelectric dams, nearly 2,300 miles of power lines and dozens of substations. Aging infrastructure – most U.S. power transmission and distribution lines were built between 1950 and 1969, with expected operating lifespans of 50 years. Technology investments – both in system reliability and investing in renewable technologies to help lower our carbon footprint. Population growth – In 2017, Pierce County saw the largest net increase of people moving into the county than any other in the United States. While growth is good, it also places increased demand on our aging infrastructure. We strategically manage our finances to help keep rates as low as possible, and we only bill customers for the revenue required to run our businesses. In Tacoma, garbage, surface water, and sewer water are provided by the city. While you see these services on your bill, we are not involved in setting their rates. They operate independently of us, but, just like TPU, City Council has final approval on their rates. We simply provide the billing and customer services functions for efficiency. If you’ve been a customer for a year or more, you can sign up for Budget Billing. We average your last 12 months of bills so you can pay the same set amount each month to make it easier to budget for and pay your utility bill. Learn more at MyTPU.org/BudgetBilling. How much are rates increasing? Residential power rates increased by 6.7%, effective April 1, 2018. The average consumer saw an increase of $5.88/month. Click here to learn about ways you can help lower your power bill. The increased rates will allow us to continue to operate and maintain the system that keeps your home supplied with safe, reliable power every day. While we know any increase has an effect on people, Tacoma Power customers still enjoy some of lowest rates in the Puget Sound region. 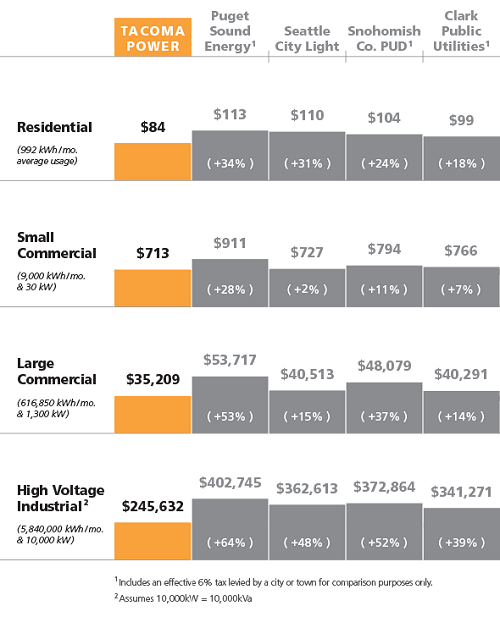 What do power rates pay for? As a public utility, we only bill customers for the revenue required to run our business and rates are based on the cost to serve each customer class. Rate increases help cover increasing costs for infrastructure improvements, regulatory requirements and increasing expenditures, among other things. It is our fiduciary duty to manage our resources and investments well, and because of our success, we’re able to borrow money at the lowest rates possible when needed, which helps stabilize our rates. In Tacoma, garbage, surface water, and sewer water are provided by the city. While you see these services on your bill, we are not involved in setting their rates. They operate independently of us, but City Council has final approval on their rates as well. We simply provide the billing and customer services functions for efficiency. For questions about environmental services, please visit https://www.cityoftacoma.org/government/city_departments/environmentalservices/. For more information about your bill, please call (253) 502-8600. If you have a dial meter, from left to right, read the smaller of the two numbers on either side of the pointer. The sample shown here has a reading of 8542. If your meter has four dials, multiply the meter reading by 10. That number is the number of kilowatt-hours you’ve used.